It’s hard to take branded motorcycle gear very seriously. By branded, we really mean fashion branded—not with the usually generous Dainese or Icon badging all over. We recently touched on Forever 21’s retro Honda Racing clothing line. We now introduce you to a Chanel and Pharrell Williams collab for a collection of helmets. I'm not sure how I feel about it. Motorcycle Clothing As High Fashion? Separately, both fashion house Chanel and artist Pharrell Williams have established themselves in their respective industries. Signer, songwriter, and producer Pharrell Williams has been hitting the market with innovative music for the best of two decades, while Coco’s brand has been a symbol of feminine elegance and independence since 1910. What do the two have in common? An undeniable sense for fashion—though you might or might not agree when it comes to Williams’ style. The brand and the artist have come together to create a fashion line, the Chanel x Pharrell Collection. What obviously stood out for us is the line of flashy, customizable helmet line powered by helmet-maker Veldt. Four styles of helmets are offered from an open face with and without visor to a full face, also with or without visor. Choosing the style is only the first step. You then get to choose from the collection of standard liveries that includes solid glossy/metallic colors and retro motifs, or head to the configurator to style and customize your helmet. The combinations are endless. Prices for the “standard” collection of helmets vary between £365 ($480) for a basic open face to £660 ($870) for the “Gold Wave” motif, full face models. In the configurator, prices go up as you add features and design elements. The prices place Veldt right up there with the likes of Shoei and Arai. This is likely due to the hand manufacturing process as well as the high-end materials used in the helmets that include an optional leather lining and a carbon fiber outer shell. The helmets are also fully convertible. In other words, you can buy the full face helmet and decide later on to the visor and the chin piece to turn it into an open face. Sizing is not as precise as with usual gear brands, the brand opting instead for “grouped” sizes (S-M, M-L, XL-XXL). To improve the sizing precision and comfort, Veldt explains that padding can be adapted (removed or swapped) to fit the size and the shape of the rider’s head. Upon order, the customer must also choose to have the helmet show either an ECE or a DOT certification. Delivery can take up to eight weeks. 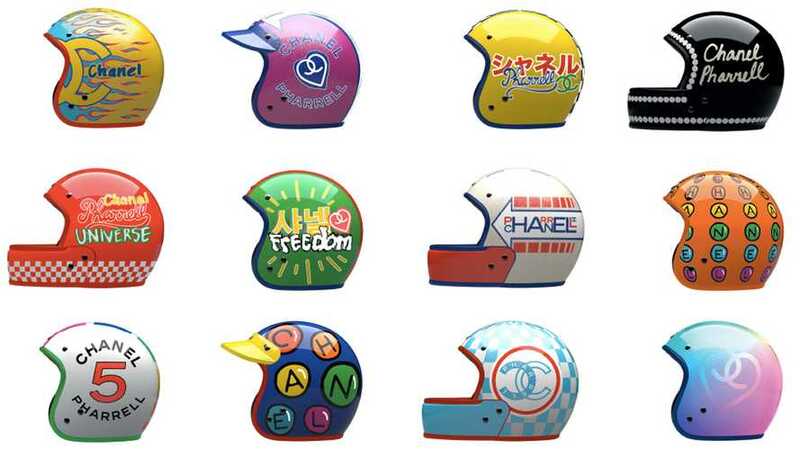 The Veldt helmets are actually pretty cool on their own—I'm not sure about the Chanel x Pharrell Collection liveries. Then again, beauty is in the eye of the beholder!